On Monday, April 9, the Feast of the Annunciation, Br. 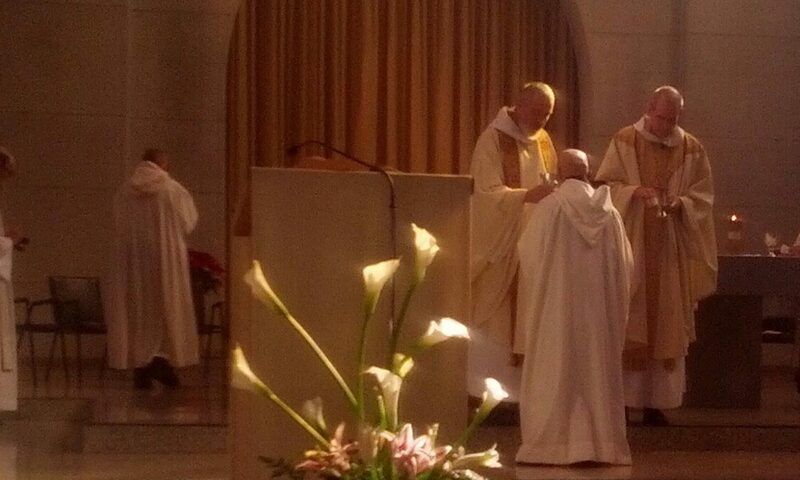 Emilio Rafael Garcia-Dolon made his solemn profession in the abbey church of Our Lady of the Holy Spirit. Br. Emilio Rafael was born in Matanzas, Cuba, in 1974. Living in an officially atheist society, his decision to be baptized on April 3, 1988, is a courageous one. After his baptism, he was given access to the library of the Cathedral where he found the writings of St. Rafael Arnaiz Baron and was attracted to Trappist life. Since there were no Trappist monasteries in Cuba, he connected with Franciscans. When he came to Miami, he lived as part of a Franciscan community associated with the Shrine of Our Lady of Charity. On his early visits to the monastery, Alain Garcia learned of our Br. Emilio Quiros, then in the infirmary. Emilio Quiros had also been born in Matanzas many years earlier. The two natives of Matanzas never met face to face because Br. Emilio Quiros died before Alain was able to visit again; however, he chose to take Emilio’s name when he entered the novitiate March 17, 2013. He entered Holy Spirit August 15, 2012, and made his 1st Profession March 22, 2015. Br. Emilio Rafael had considered requesting to make his final vows on April 27, the feast of St. Rafael. However, Annunciation, transferred to April 9, was chosen. It was not until the reception after he made his solemn profession that he was reminded that April 9 was the birth date of St Rafael in 1911.